‘The Brood of Erys’ begins in a very traditional fashion as the TARDIS receives a mysterious message warning its crew not to venture any further toward a single planet and its moon. His curiosity getting the best of him, the Doctor ignores the warning and lands, only for the TARDIS to be raided by the impish Drachee as Flip gets carried away into an ever-darkening mystery. Writer Andrew Smith manages to create a very memorable setting and grand sense of scale very quickly, but the story quickly switches from one of physical antagonists to one of psychological terrors. While it perhaps comes as little surprise that ‘The Brood of Erys’ once more deals with a conscious and intelligent planetoid, a concept that is becoming more common as time progresses, Smith is at least able to offer a unique take on the premise that sets his story apart from earlier ones as he intertwines a tale of an amnesiac woman with a dark history, the implications of a sentient landmass for its inhabitants, and an intriguing exploration of the mind. The title suggests that children are a significant component to this story, and Smith brings in several different parents and children throughout the course of the tale, some used to better effect than others. Perhaps the most intriguing relationship is that of the Erys and the Drachee, the moon’s biological cycle providing specific nutrients its denizens need to survive. The truth behind the Asphyan avatars and the fact that Erys has created its own Drachee spy to determine what the Drachee’s plans in their quest for freedom are work a bit less successfully, but both aspects do add significant layering to the relationship and motivations on display. Stranger yet is the truth behind Sarra, a woman who has chosen to have her mind wiped to subvert the influence of Erys in order to search for her own family members who went missing on an illicit and dangerous tour of Erys, planning to injure the planet enough to allow their escape. Brian Shelley does quite well playing the simultaneously benevolent and jealous godlike presence of Erys, but Colin Baker and Lisa Greenwood are assuredly still the standout stars of this story. That said, for a story so focused on family and relationships, it is sorely apparent that the relationship between the two leads is not explored at all. The two have previously been compared to a father and daughter, but that dynamic is completely omitted here, and even the opportunity to explore Flip as an outsider as the only person with no immediate connection to a parent or daughter is skipped. Admittedly, the discussion about Susan as the companion the Doctor has elevated above all others does seem a bit forced even as it parallels Erys’s decision to let ts children go, but it does also at least allow Flip to better understand the Doctor while accepting his continued desire to search for Peri. ‘The Brood of Erys’ has several intriguing ideas, and the change of settings and solid sound design help to create a believable and well-paced story that touches on very human aspects on an altogether more incredible scale. 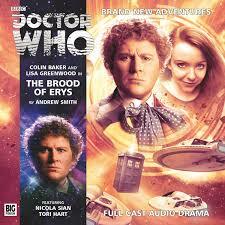 Though there isn’t quite enough material for four episodes without some repetition and Sarra’s story ends rather glibly with no real emotional fallout, ‘The Brood of Erys’ is a definite step in the right direction for Big Finish’s 2014 main range.